Hawkeye Downs Speedway (IA) General Manager and Race Director Jim Amstutz passed away Wednesday after battling cancer since late this summer. Amstutz will be remembered as a true friend of short track racing. Amstutz knew his product and was often ahead of the curve in racing. For years, he led the Hawkeye Downs ASA races to be some of the biggest and best attended stops on the schedule. But when the ASA National Tour went into a decline a few years later, Amstutz was one of the first to see it. 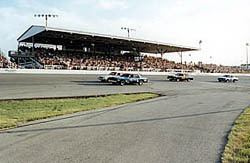 Prior to the 2004 season, he made the decision to drop the ASA National Tour from the Hawkeye Downs schedule despite its rich history at the track. In place of the ASA NT, he elected to book the ASA Late Models instead. That event was a success and less than one year later, the National Tour would close down while the ASA LM Series prospered. "Jim was truly a great guy for ASA and for short track racing in general," said Speed51.com's Jeremy Troiano, who dealt with Amstutz for years when Troiano worked as a Public Relations representative for ASA. "Jim was one of those people you just liked to be around because he always had a smile on his face. He always knew what needed to be done and how to do it to put on a good show. "It was really shocking to see that he'd passed away. Jim was a leader in Cedar Rapids and was a dear friend to a lot of people in the ASA community. He will be greatly missed by all of those. There just aren’t enough promoters like Jim any more these days." Amstutz was a champion of controlling costs in racing and not turning short track racing into something it wasn’t. The ASA Late Models were a hit at Hawkeye Downs thanks to Amstutz's efforts. Prior to leading up Hawkeye Downs, Amstutz was the promoter at Angola Motor Speedway (IN). Amstutz was also very well known around the Northeast Indiana area as the voice of most of the Angola Motor Speedway commercials since the late 1990's. He was also the voice for the Fort Wayne Komets, an UHL hockey team, until he relocated to Cedar Rapids, Iowa for the General Manager position at Hawkeye Downs. The ASL ran a race at Hawkeye Downs this season. At Jim's request his services will be held in Cedar Rapids, IA and burial will be close to his Lisbon, IA home. The Viewing is scheduled for Friday Evening. Speed51.com sends our thoughts and prayers to all of Amstutz’s family and friends.